Click image to watch the video or read the transcript. You can follow each team on the American Solar Challenge website. The race honors the 50th anniversary of the National Trail System and the 175th anniversary of The Oregon Trail. 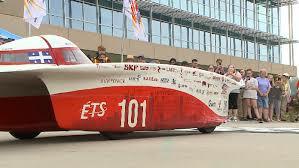 This entry was posted in Nebraska / Midwest News, Solar Energy Education and tagged American Solar Challenge, KETV on July 14, 2018 by Helen Deffenbacher.